AMA offers a comprehensive vehicle recovery service. Whether vehicle recovery is required under the authority of a decree of court or otherwise, our experience in this area leads to a high success rate for clients. At AMA our aim is to try and ensure that the vehicle is recovered at the earliest opportunity and in the best condition possible (with keys and documentation) enabling the greatest possible financial return to the creditor. Where required our Investigation Team will carry out the necessary work to trace both vehicle and documentation. Where the vehicle cannot be moved either through technical issues or lack of documentation, AMA will arrange the necessary sub-contractors to uplift the vehicle. It should be borne in mind that both the officer’s fee and the costs of the sub-contractor are not recoverable from the debtor. Sub-contractors costs will include the uplift and time in transit to the creditor’s specified delivery location. Use of a towing company is avoided where possible to ensure maximum return to the creditor. 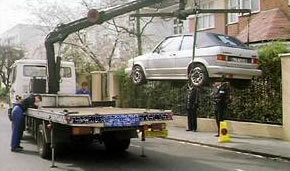 A court order in Scotland authorises a Sheriff Officer to uplift a vehicle from a debtor. In the absence of a court order a Sheriff Officer cannot enforce the uplift of a vehicle without the co-operation of the debtor. We are instructed to uplift vehicles where there has been default under the Consumer Credit Act and the property in the vehicle has reverted to the creditor. While we can accept these instructions we can only uplift the vehicle if the debtor voluntarily surrenders the vehicle to us. In the absence of voluntary surrender, a court order will be required. AMA can advise clients of solicitors who can act for them in these matters. Our Investigation team offer a service to banks and other financial institutions to recover credit and debit cards from defaulters. This service includes tracing the defaulter and endeavouring to recover the card. In the absence of a decree we require the co-operation of the debtor. If a decree to recover possession is available, we do have the authority to search for and take possession of the card. As part of our Sheriff Officer services we do as a matter of course enforce recovery of goods where a court order is in force. These court orders do contain authority to search for and recover any items included in the decree.